Funny that I just wrote a post on how to get your work published,that I received some good news regarding my own art. I had submitted my work to Adbusters Magazine quite some time ago and the right opportunity has finally presented itself. It just so happens my painting “Special Ingredients” is the perfect fit for one of their features and will be in the July/August 2010 issue. (That’s it on the left!) More good news- my work will also be featured with an artist’s profile/gallery on the beinArt Surreal Art Collective. I’ve been a fan of this site for quite awhile now and am honored to be included among the many talented artists featured there. I don’t have an exact date on when my work will be posted, but I will let everyone know as soon as it is online. In the meantime, be sure to check out their site (the name is a link!) and also be sure to check out Adbusters- online or in the bookstore. And if you would like to see more of my work, visit my website at www.AmyGuidry.com. One question that I seem to get repeatedly as an artist, and not from viewers but from other artists, is “how do you get your work published?” On my website, you will find a Press section in which I post articles in newspapers, magazines, and sometimes online articles about my work. (Take a look at www.amyguidry.com/press.html) If I had to estimate, I would say that 70% of those originated because I notified writers and editors about my exhibits or announcements. 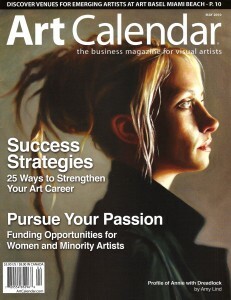 (For the record, Art Calendar’s Louise Buyo contacted me- I just got lucky on that one!) Of course these days, press is viral, so if one blog or paper publishes you, another will then post something. I’ve had that happen a lot as well, which I did not directly influence. Anyway, I want to give you some helpful information to boost your own publicity. First, assuming you already know what you want to promote, make a list of your local media. If it’s an out-of-state show, you should also do some research and find their media contacts as well. Get some double-duty out of your efforts. Once you have your media contacts- names of actual people, not just the name of the newspaper, etc., you can start writing your press release. I’m no writer, (yes, ironic since I have a blog…), but I always write a press release when I have a show or a big award or something I think the general public may find interesting. In your press release, which I like to limit to a one-page letter for expediency, you should give the usual- who, where, when, how, and why. You don’t want to write a bland description covering all these bases. I know- but isn’t that the writer’s job- to spruce things up? Yes, but there is a lot of news out there in the world, and especially for newspapers, it has to be covered quickly on a daily basis and they don’t have enough writers to possibly cover everything. This means you need to get their attention with something that sounds too great to not write about and make it easy for the writer to get all their information in the least amount of time possible. So, here’s how to do it: You need a pitch. You can’t just write, “I am having an exhibition this Saturday at the Big Time Art Museum.” Start brainstorming. What reasons do you have for the public to find this interesting? Think in terms of impressing not just your writer or editor, but the public as well since that’s who you’re ultimately trying to impress. Think of what would matter most to the public. What is the most significant factor behind your news? How will it affect the public? Think of this as telling a story, not just stating facts. Once you have your letter written, you can then add to your press release by including images. Either photographs, or a CD, or a brochure- just something with images pertaining to your news. A CD may be best since the writer can automatically use images from it, but if you can also offer to email high-resolution images. Oh, and be sure to send all of this to your media prospects well in advance of your event. I have found that it can take up to 3 months to get coverage, so the sooner the better. Depending on the publication, they may be booked for awhile and not able to fit your story in on short notice. Regardless, give at least a month’s notice to ensure at least some coverage. If you’ve been following my blog, you may recall awhile back that I was to have a show at the Schepis Museum in Columbia, LA. Well, since that show had been planned a year in advance, and a lot can happen in the meantime, there were renovations being made that turned into a bigger project than expected. So my show had to be postponed. Well, I am happy to say that the time has come and my exhibit will open next month at the Schepis. This will be a solo exhibition of my New Realm series. This series has been in several locations in Louisiana, as well as Austin and Las Vegas. No two shows have ever been the same since works are sold and replaced or new work has been added by the time another show opens. So on and so forth. The exhibit will open next month- May- and be open through the end of June. With a two-month display time, this should give many of you a chance to see the work in person. I can’t stress enough that I have to use low-res, small images on the web (thanks to copyright infringement), so seeing my paintings in person is a whole other experience. The opening reception will be held on Sunday, May 30th from 2-4 pm. 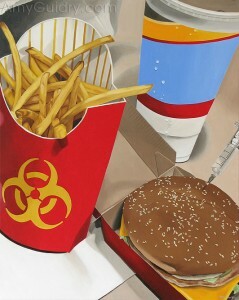 Many works from the New Realm series can be seen online at www.AmyGuidry.com. While you are there, be sure to check out my Press section for an article in the current issue of Art Calendar Magazine about New Realm. 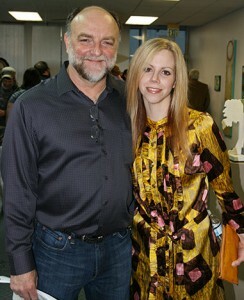 "Artist Amy Guidry with Gallery 549 Director Don LeBlanc"
I think you should give the people what they want, and I have noticed as of late searches to my blog for info on the Second Saturday Artwalk in Lafayette, LA. So since I am a regular attendee and sometimes exhibiting artist of the ArtWalk, I thought I should provide a schedule for this month. The April Artwalk is in conjunction with Festival International, so there are some special performances listed. Kind of short notice, but all of this will take place TOMORROW- April 10th. I came across an article the other day in the October 2009 issue of Allure magazine that I wanted to share. Their “Insider’s Guide” series usually takes on interesting topics with a sort of “how-to” approach. I found this one particularly interesting since it deals with art. Rory Evans wrote the piece “How to Visit an Art Gallery” which can be found online at http://www.allure.com/howtos/2010/01/visit_art_gallery. Silly as it may seem, there are many people that have never even set foot in a gallery before and honestly are intimidated. You don’t need to wax poetic about art or philosophy in order to attend an opening or visit a gallery on your own time. Just as anyone can appreciate music or film, the same goes for the visual arts. I can’t play an instrument, but I like Mozart. There’s no harm in that. So here are some basics. First, galleries are free to visit. You are under no obligation to buy anything and you don’t have to pay to enter. (Museums usually have an admission cost or a suggested admission cost, but it won’t break the bank.) Galleries are generally open Tuesday through Saturday. Openings are generally held on weekends, usually the first or second weekend (be it a Friday or Saturday) of the month. Openings are held in the evenings in most cases, and are late hours with a high attendance. During the week it will be quieter, so you will have more opportunities to focus on the art and even stand back and view the work as a whole. Galleries and museums both offer work for sale, but not all work is for sale in a museum. So if you are looking to buy, you have more options with galleries. They also change their shows on a monthly basis (for the most part), so there is always something new to see. Galleries will also introduce you to more “new” artists that may not have had as much exposure yet, whereas museums usually grant shows to more established artists. Understanding the art does not require the Rosetta Stone. 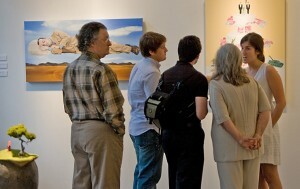 For starters, there’s usually an artist statement posted in the gallery whenever there is a show. The artist statement is written by the artist and is their personal account for their work. This will give you a good general idea about the roomful of work you see. It goes without saying, but also take into consideration the name of the show and the titles for the individual artworks. Many artists will admit that there are multiple interpretations of their work and that’s perfectly normal. You may see something different than the artist, or maybe you can add to what the artist feels. There’s no right or wrong answer. No one can tell you how to feel or what to feel, that’s your interpretation to make. All the artist can do is provide you with the information. And even if you do not have the opportunity to meet with the artist personally, you can always ask someone that works for the gallery. As for this artist, I am always open to questions, so feel free to contact me at www.AmyGuidry.com.